Munster lost further ground on Glasgow Warriors at the top of Conference A of the Guinness PRO14 following an evening to forget in Wales. The visitors paid the price for a poor first half as they turned around 19-5 down, and although Munster threatened a second-half comeback, the Blues were the better side. 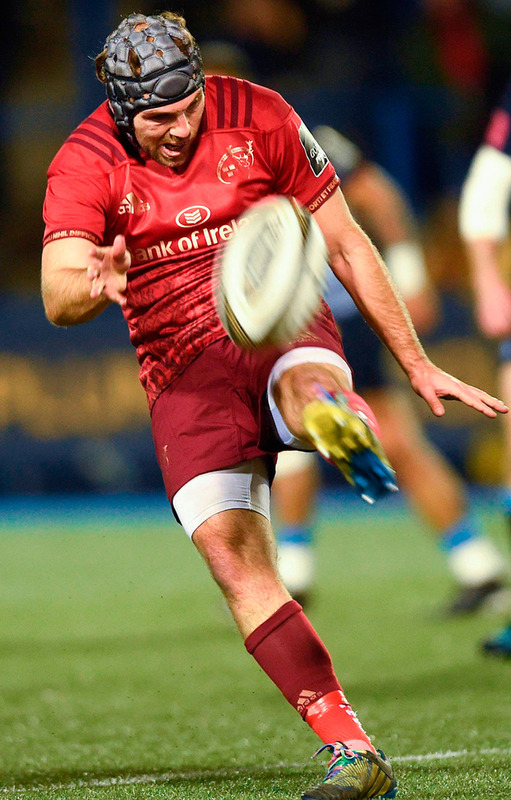 Tries in either half from Chris Cloete and Stephen Fitzgerald plus the boot of Ian Keatley accounted for Munster's points as they went down to defeat. 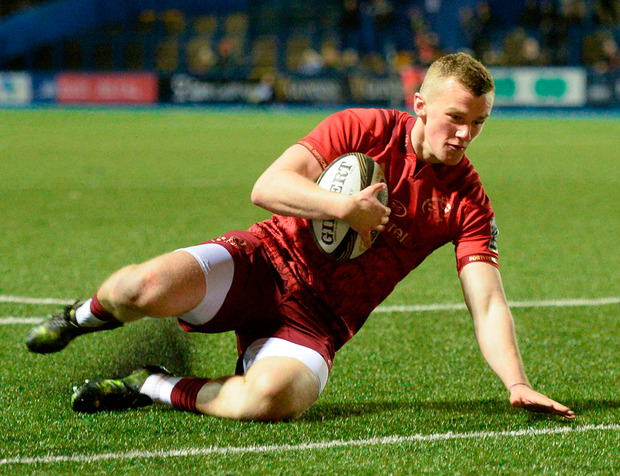 Macauley Cook, Lloyd Williams and Owen Lane scored tries for the Blues and Jarrod Evans kicked two conversions and two crucial second-half penalties to secure victory for Cardiff. This was a poor result for Johann van Graan's men who were the architects of their own downfall but did secure a losing bonus point through Tyler Bleyendaal's last kick of the game. Backed by a strong travelling contingent of fans which bolstered a poor Arms Park crowd, Munster fielded a strong side. Four of Ireland's Six Nations squad made Van Graan's starting line-up. Rory Scannell and Keatley both began in the back division, Munster having of the luxury of being able to leave Bleyendaal and Simon Zebo among the replacements. It was a scrappy start, both sides putting boot to ball, before Keatley hooked an awful ninth-minute penalty attempt wide. The Blues looked threatening with ball in hand and they eventually broke through Munster's wall of red in defence. Cook was the first scorer, the hosts producing a neat lineout move which ended with Ellis Jenkins sending his back-row partner over to score. It looked like there was both a forward pass and a knock on from Jenkins in the build-up to the try, but it was given despite visiting captain Jack O'Donoghue's protestations. Evans missed the conversion, but things then went from bad to worse for Munster. Duncan Williams's box-kick attempt was charged down by his opposite number Lloyd Williams, who dived over, and then from a scrum, Rey Lee-Lo kicked ahead for Lane to win the race to the ball. Evans added both conversions as the hosts scored three times in eight minutes in a decisive blitz. Munster were disappointing as they made a series of basic errors. They did hit back through a close-range effort from Cloete, Keatley missing the conversion. Home centre Lee-Lo was also lucky to avoid a yellow card for what looked like a deliberate knock-on just before the break. Munster started the second period with a bang, no doubt given a half-time rollicking for their poor first period. Keatley kicked a simple penalty to narrow their deficit and the visitors were transformed. 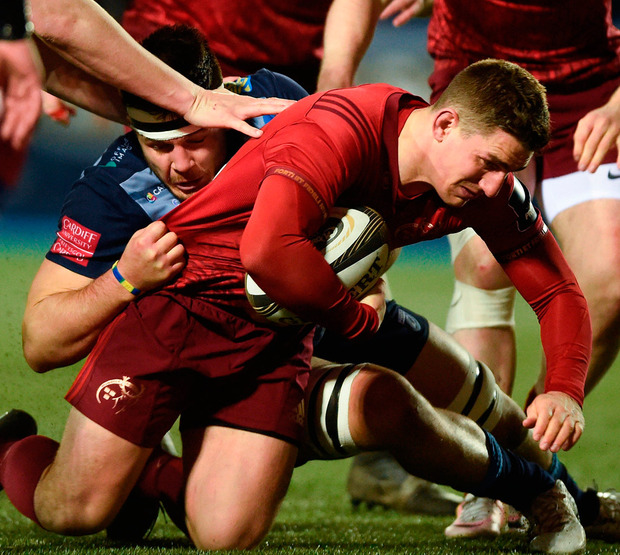 Matthew Rees's yellow card for offside gave Munster further impetus and full-back Fitzgerald then found himself on the end of a flowing team move to score his team's second. Keatley converted and at 19-15, Munster were now back in the game. It didn't last. The Blues showed admirable restraint to respond to a tricky spell and buoyed by a series of replacements, they got back in control. Referee Stuart Berry penalised them a number of times, but two critical three pointers from Evans made sure they were home and hosed. Bleyendaal came off the bench and his penalty meant Munster did take something from the game. Scorers - Cardiff Blues: Cook, L Williams, Lane 27 try each; Evans 2 pens, 2 cons. Munster: Cloete, Fitzgerald tries; Keatley 54 pen, con; Bleyendaal pen.